Good news! Last night I was able to cut out all of my stencils for this project. It took my full 2 hour reservation to get all 16 done, but I did it. The bad news is that I’m going to the beach for the long weekend and won’t get a chance to finish this project until Tuesday. … wait, the beach sounds like good news, too. Surprise! 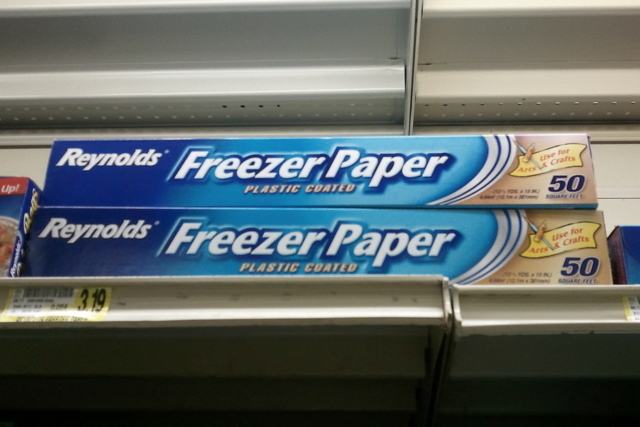 Freezer paper is available at my local grocery store. This is amazing to me because my local grocery store is small and never seems to have normal things that I am looking for. I didn’t hold out much hope that it would have freezer paper. But there it was, on the top shelf near the plastic wrap, advertising its many craft uses right on the box. I quickly snapped this blurry shot with my cell phone and bought some. I need to spend some time getting my stencil design right and converting it to a format that will work on the laser. My laser appointment is Thursday night. Then I’ll need to find time to do the actual stenciling. Time is something I am unfortunately short on for the immediate future, so I will do my best to get this done if you will do your best to be patient with me. Ashley from the great blog Make it and Love it posted a couple of freezer paper stenciling tutorials that really inspired me. The brilliant thing about freezer paper is that it has a plastic coating on one side that melts when you iron it and adheres the paper to your fabric. 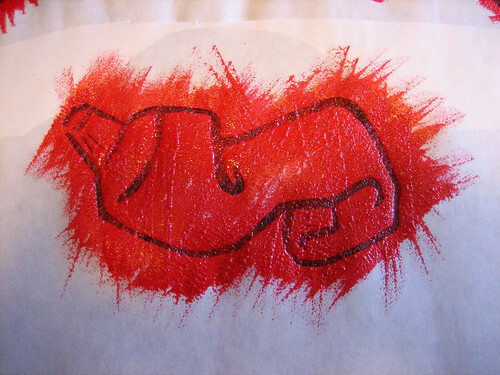 Then, after you are done with your stencil, you pull the paper off and it leaves no residue. You can get a really clean line. I am excited to try this technique on my new shades, but first I have to find freezer paper. First stop: the grocery store. This week I am going to apply a design to my new sliding panel window shades using a freezer paper stenciling technique. Join me as I shop for freezer paper, cut out my stencil (hopefully with lasers), and dress up my shades. You are currently browsing the archives for the Stencil category.